This summer, we moved out of our apartment and into our first house. 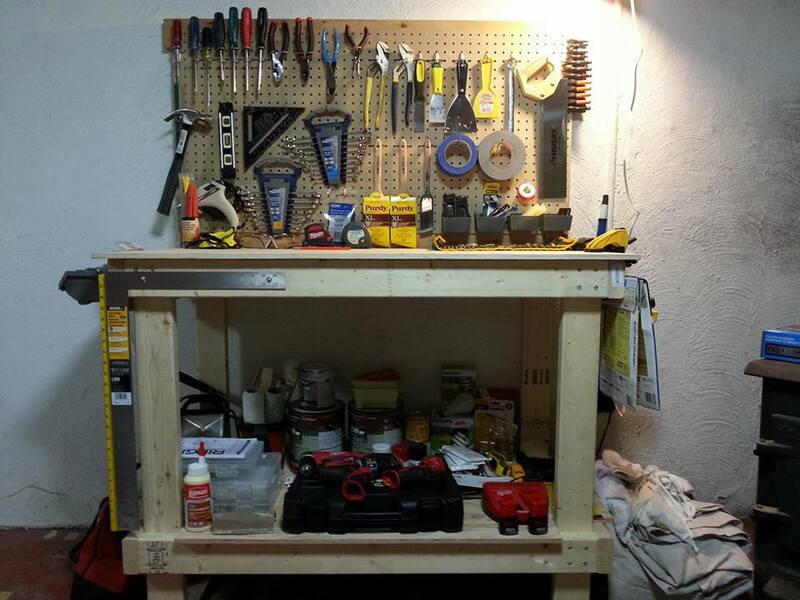 Although the house is in good shape, there is some work that needs to be done, so one of the first jobs was to set up a workshop space. 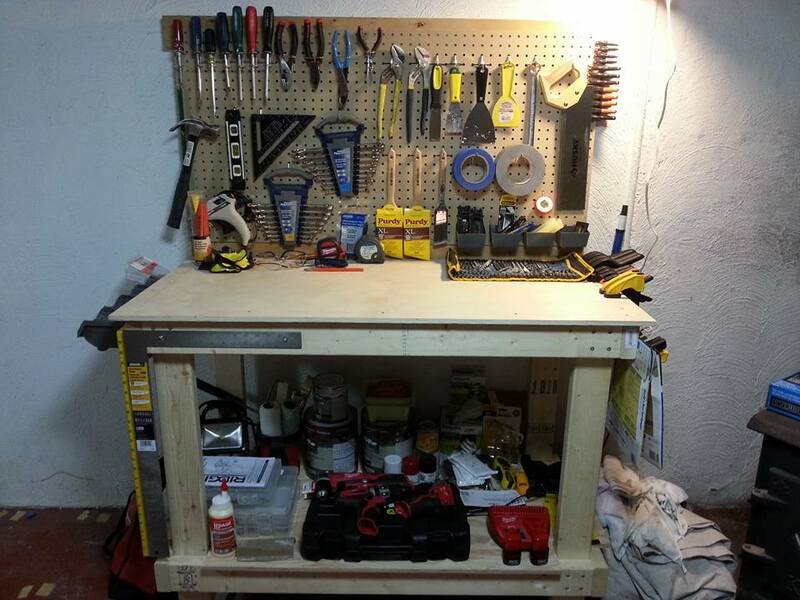 It’s nice to have somewhere to store my tools instead of being confined to the corner of a closet. If you’ve never built anything before, don’t worry. 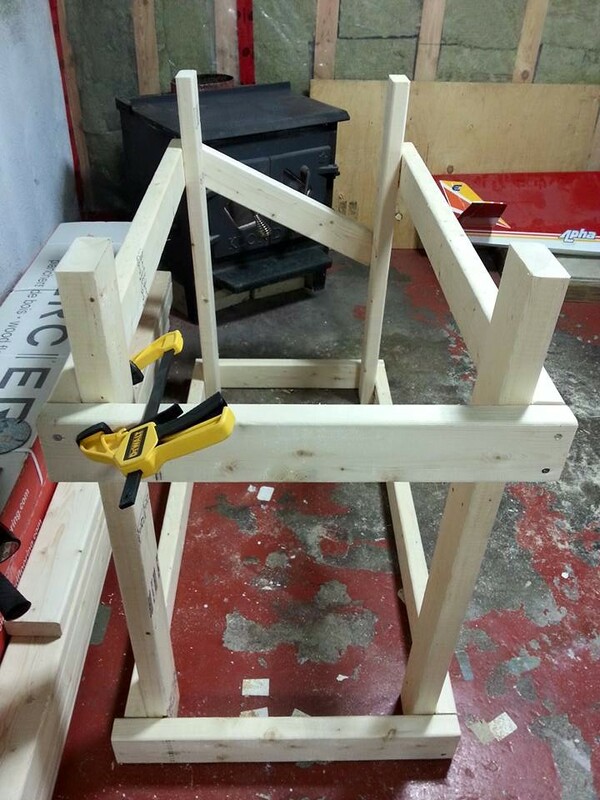 This bench is easy to make, and only costs about $50 in materials. It’s made of 2x4s, and you just need four of each length, plus a half sheet of good one side plywood, cut into two pieces about 2′ by 4′. 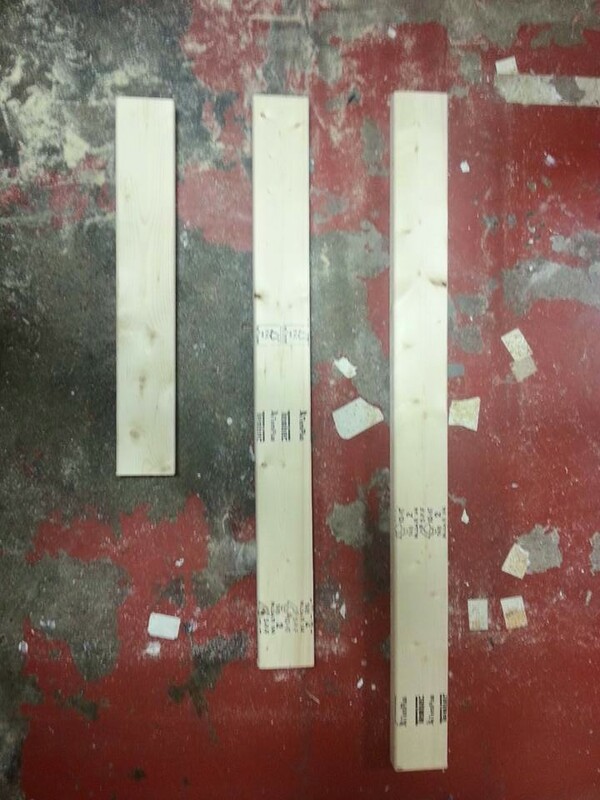 Start by cutting the frame pieces out of the 2x4s. My legs are 36″, my front and back stringers are 46″, and my side stringers are 23″. I assembled the front and back first. Each consists of two legs (the vertical pieces) and two long stringers (the horizontal pieces). 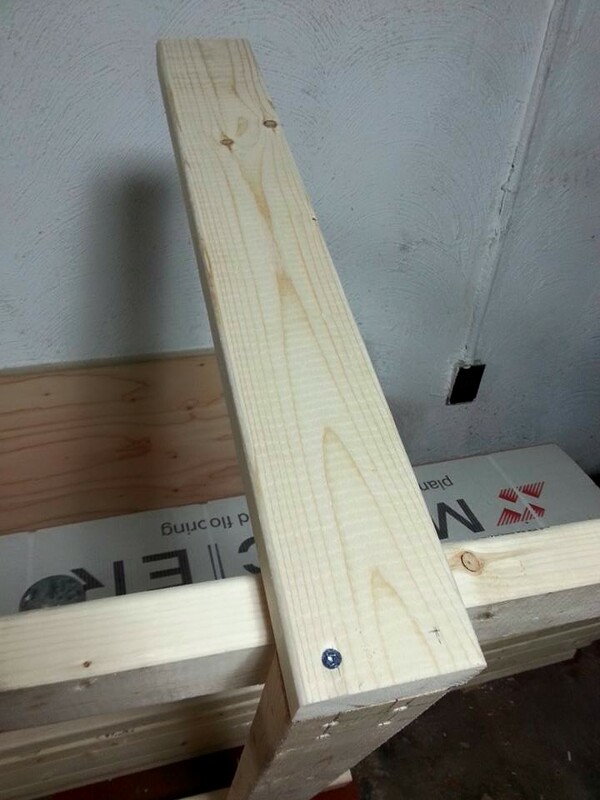 I attached all of the pieces of the bench with 2 1/2″ screws. 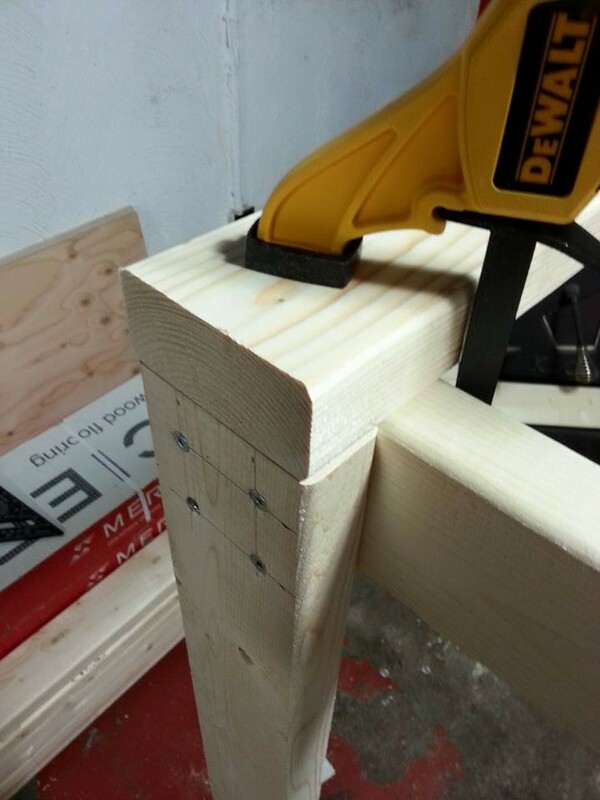 Because I was screwing so close to the edges of the wood, I was sure to pre-drill the holes. 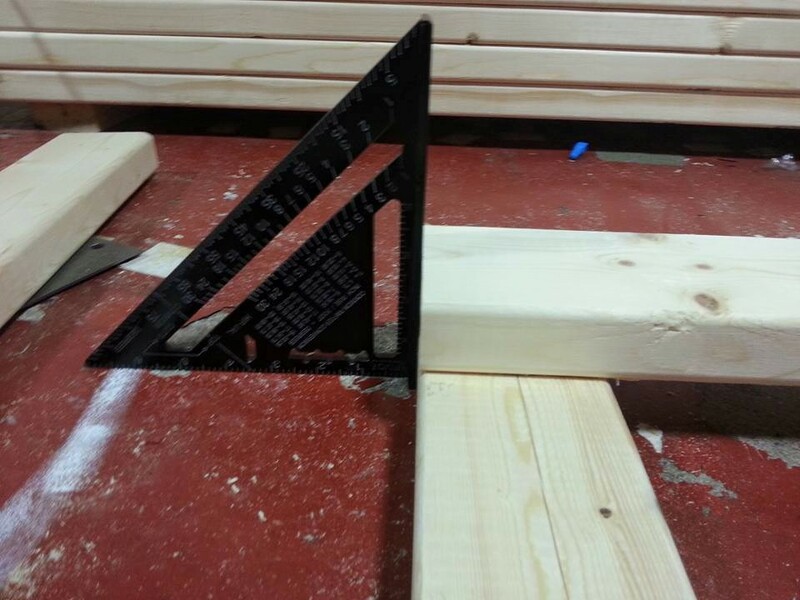 It’s important to make sure that the edges of each corner that you drill are flush. I marked out where I was going to drive in my screws. An inch from each edge is good. To start with, only drive one screw per corner. This will allow you to push everything into square before driving the rest of the screws and locking the joints into place. If the piece is square, then the distance from each top corner to the opposite bottom corner will be the same. 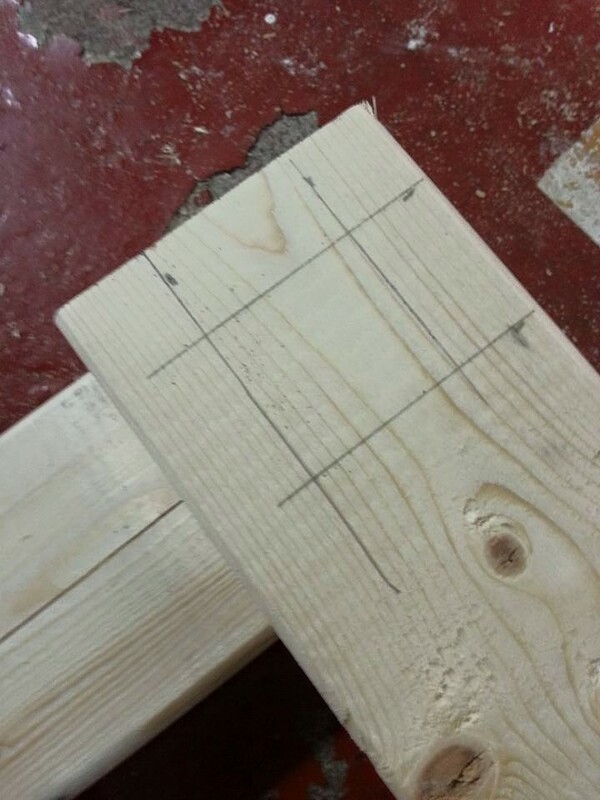 If it’s out, just push the stringers in opposite directions until everything lines up. 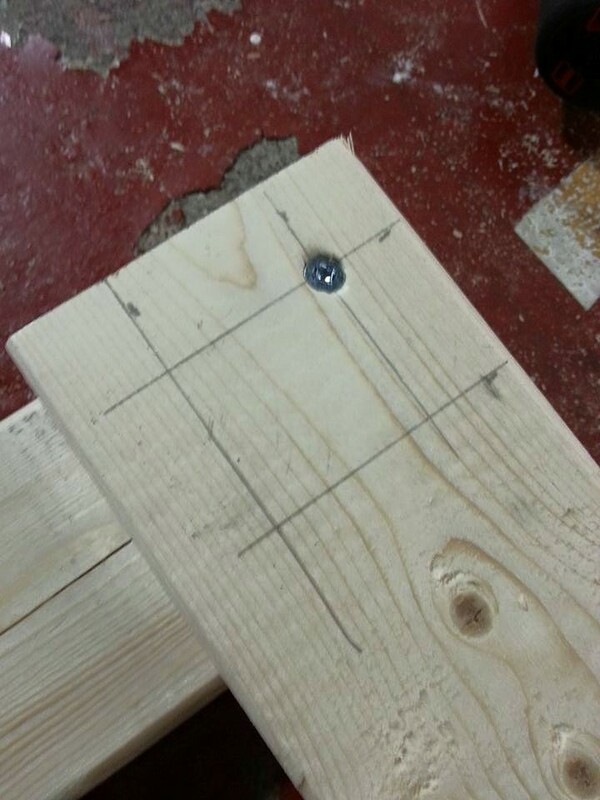 Once the piece is square, drive the other three screws into each corner. This will lock all of the angles in place. Once the front and back are built, it’s time to attach the side stringers. 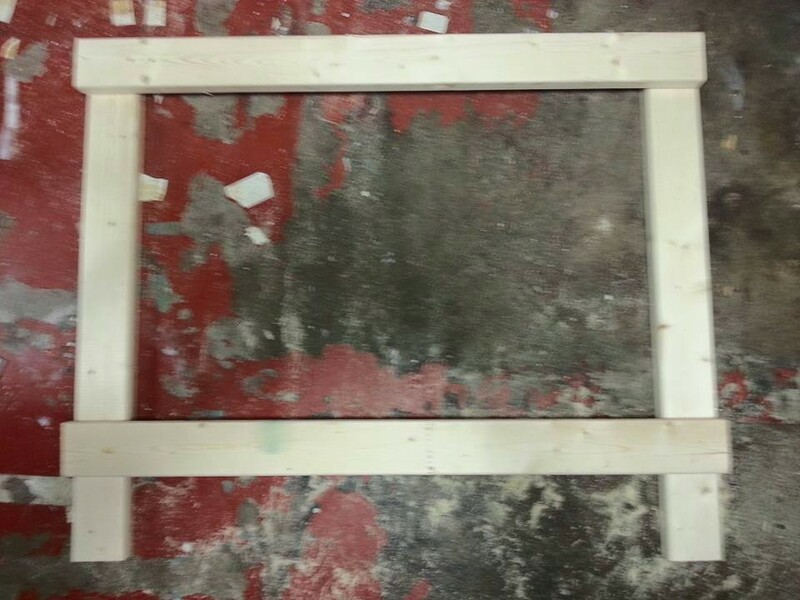 I stood the front on end and clamped the side stringer to it so that I had both hands free to drive the screw in. Same as before, only drive one screw per corner to start. Because the screws for the front stringers were one inch in from each side, I put the screws for the side stringers 3/4″ in from each side. 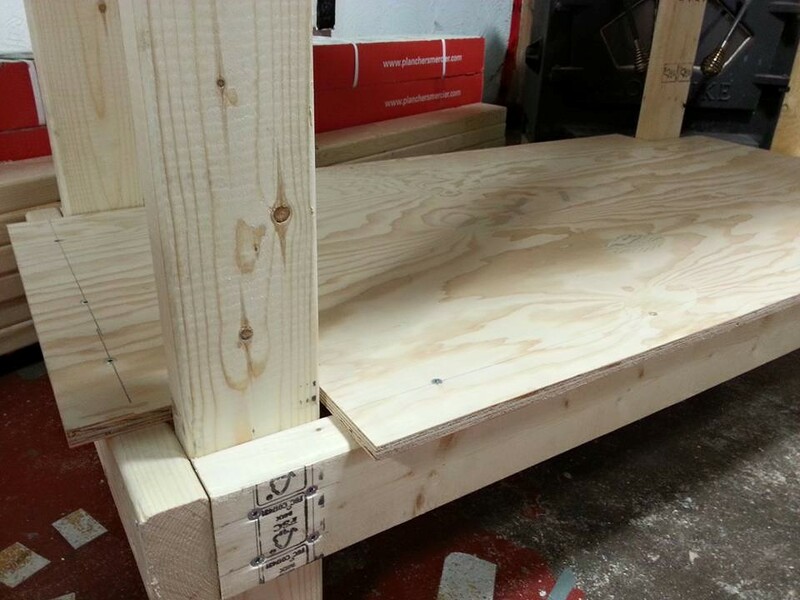 Once the side stringers are attached to the front and back of the bench, it’s time to bring the two pieces together. Now it’s starting to look like a bench. An upside down bench, but a bench nevertheless. Again, square everything up, and then drive the rest of the screws in to lock the angles. After flipping the bench over, I put the top on. 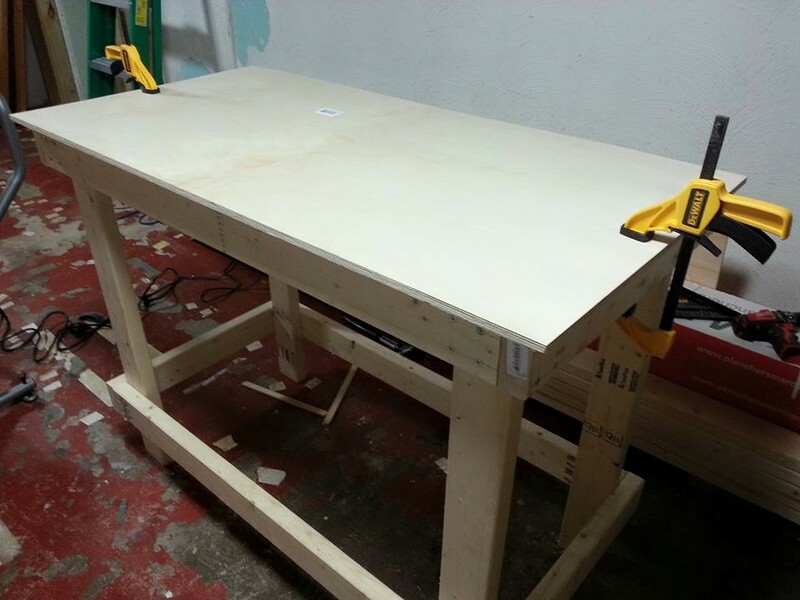 I used a 2’x4′ sheet of 1/2″ GIS plywood for the top of my bench. The size of the frame gives me an inch of overhang at the front and on both sides. 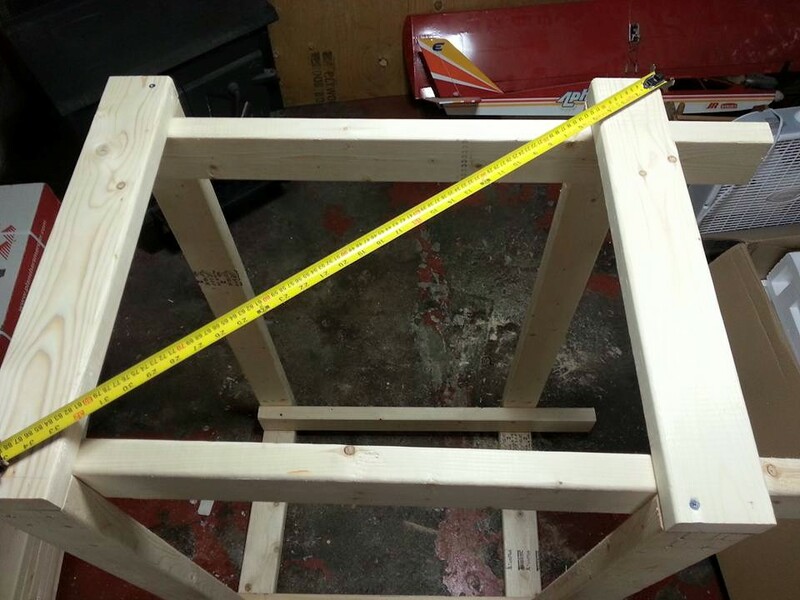 The top is affixed to the bench with 1 1/4″ screws. 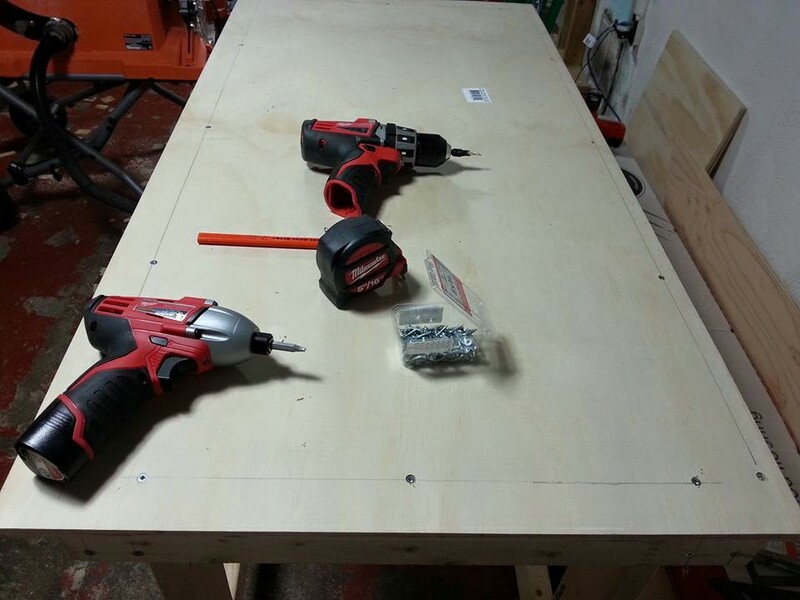 I chose to countersink the screws around the bench top so that they’re flush with the work surface. My bench has a shelf below the top. 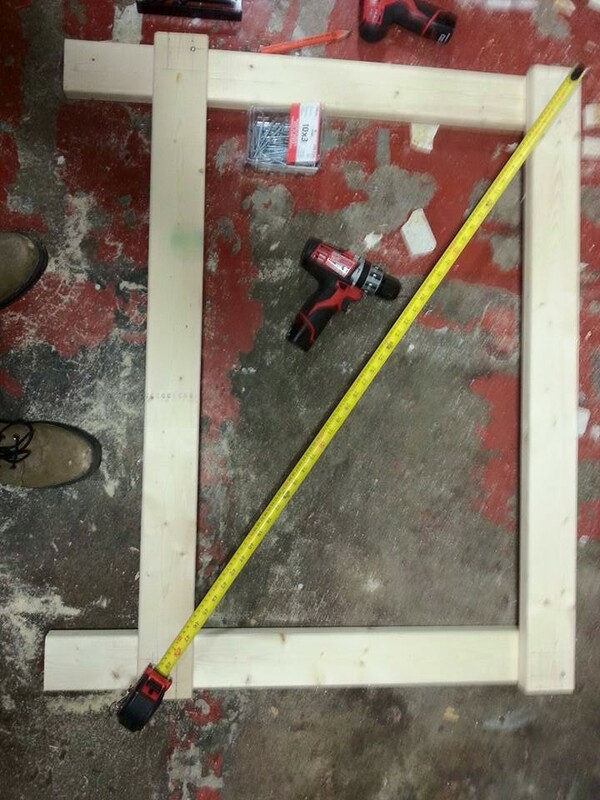 It’s made of the same 3/4″ good one side plywood as the top, but I had to notch out space for the legs. All set up and loaded with tools! I attached a peg board to the wall behind the bench for some extra storage space.